The majority of the pharmaceutical (temperature controlled) supply chain has been well qualified and documented over a number of years within the most common areas, such as warehousing, cold storage and vehicles. However there has been very limited work carried out to fully understand the conditions that are experienced in the cargo holds of aircraft used for the transportation of temperature sensitive pharmaceutical products. For this reason, Biomap and Pharmafreight decided to partner up and use their respective areas of expertise to undertake the challenging process of mapping an aircraft during a live flight, to understand the temperature profile during flight and any risk areas that were highlighted in the recorded data. Biomap would offer the resource and expertise for the mapping element, and Pharmafreight would utilise its relationships with the airlines and freight forwarding expertise in preparing pharma consignments for carriage by airfreight. A number of airlines offering a pharmaceutical service were approached to support the project by allowing access to their aircraft for the mapping exercise. We knew this would be a complex task in light of the tight security around accessing aircraft and freight during the loading process at the airport. We also wanted to be able to share the data with industry by presenting the results at various professional discussion forums and seminars, whatever the data gathered showed, good or bad. Etihad Airways were one of the carriers approached, as we knew that in addition to its core activity of passenger transportation, they also operated a significant cargo section perfect for the joint study. Etihad were incredibly supportive of the project scope from the start, as it had been looking to develop the transportation side of its cargo operations for pharmaceutical products, and there would be huge value in being able to demonstrate the temperature performance of a cargo hold of their aircraft during flight. Etihad Airways is the second-largest airline of the United Arab Emirates, and commenced operations in November 2003 with its head office in Khalifa City, Abu Dhabi, near Abu Dhabi International Airport. It operates a fleet of 120 narrow and wide-body Airbus and Boeing aircraft within the Middle East, Europe, Asia, North America, Canada and Australia. This equates to more than 1,000 flights per week to over 110 passenger and cargo destinations. Biomap and Pharmafreight proposed a solution and Etihad kindly agreed to offer an aircraft for the project, and a date was agreed. Biomap raised a comprehensive protocol and plan documenting the suggested approach to map a Boeing B777, one of the most commonly used aircrafts used for this type of freight. From the outset the project reminded us how quickly things can change with airfreight when at the last minute, the operating aircraft was changed from a B777 to an Airbus A330-200. Not an ideal situation as the protocol and plans were designed for the B777 configuration. This meant a speedy redesign of the protocol and logger placement requiring approval before we could commence. This was achieved and the mapping process continued with the new protocol. The initial exercise was conducted during winter at Manchester Airport – United Kingdom, to Abu Dhabi International Airport – United Arab Emirates, where it is generally quite warm all year around, with an approximate flight time of seven hours. The mapping study would determine if any hot and cold spots would occur during the exercise, and look to highlight any temperature issues experienced during flight. 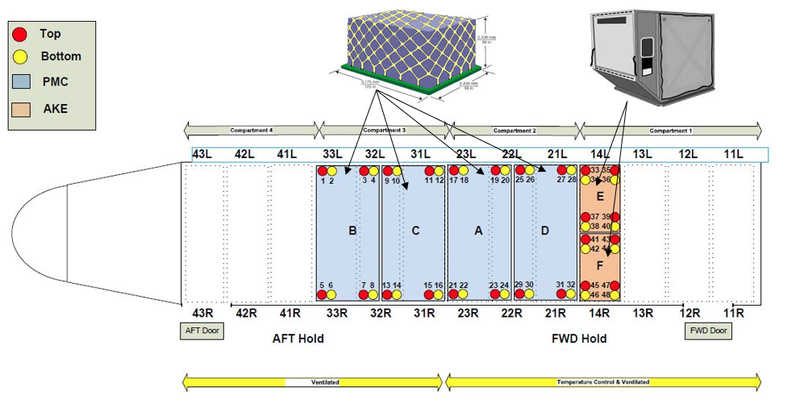 A full temperature mapping exercise was conducted with data loggers positioned throughout the cargo hold (see fig.1) where the pharmaceutical products were transported, and a number of temperature excursions were recorded between the departure and arrival times. 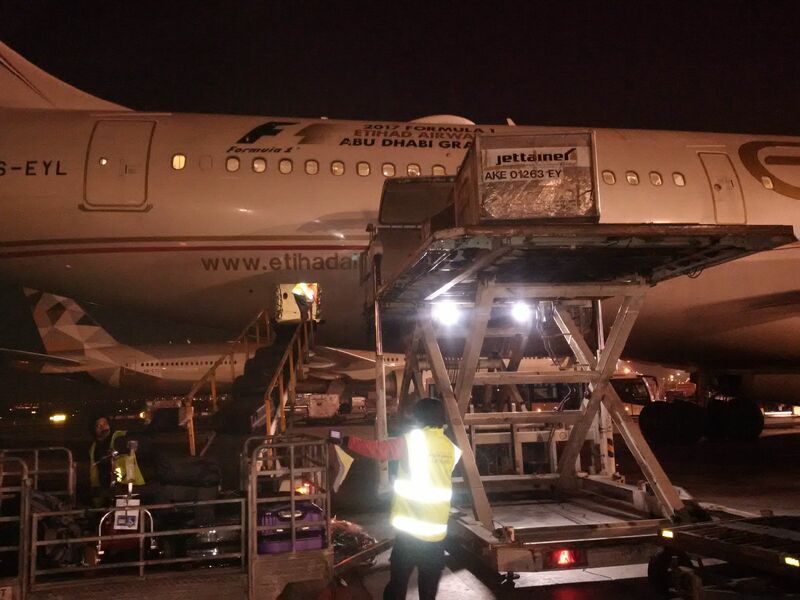 Biomap and Pharmafreight staff supported the installation at Manchester Airport, while Etihad personnel located and retrieved the data loggers at Abu Dhabi Airport, once the flight was complete. These were then handed back to Biomap’s offices in London for processing and data assessment. Once this was complete, full reports for the hold conditions during flight were produced. This included full graphical and summary data, as well as detailed analysis of the temperature performance and full reports were then submitted for review. As the initial aircraft for the mapping exercise had changed on the day of the flight, the project will be repeated with a B777 as originally planned. 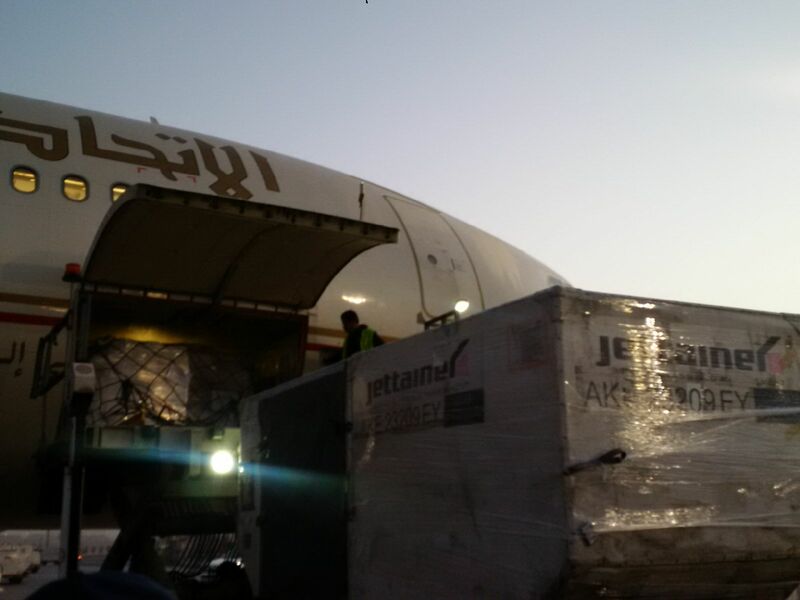 This particular aircraft is the most commonly used by the Etihad fleet for transporting pharmaceutical products. Would you like to know more about our Temperature Mapping Service?